I am so terribly late in blogging about this (thanks to another busy travelling work week)! 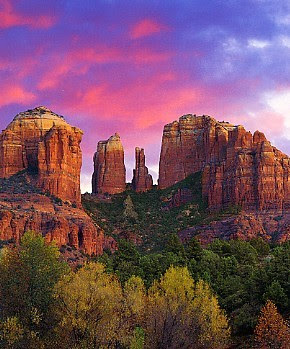 I can't complain too much this time though since my job duties required that I spend some time in lovely Sedona! I didn't get to spend too much time out of doors, but just driving to this breathtaking little corner of the world is enough to make anyone sigh with delight! The best part of my week, however, was the absolutely wonderful treat that arrived in my mailbox. 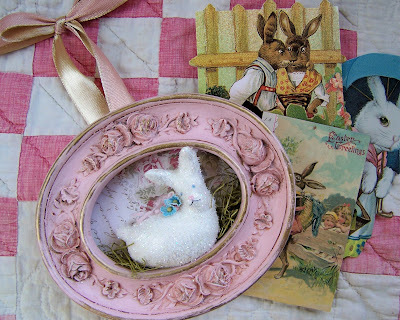 A wonderful package from the extremely talented Lori of Faerie Window. This sweet bunny is just amazing. I cant describe how happy I feel just looking at her! She will be hanging in our home year round!!!! She absolutely sparkles in the sweet chic frame. Thank you so much Lori!!! 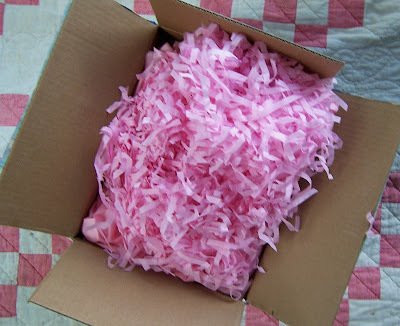 I hope that you like the package that I sent to you!!!!! 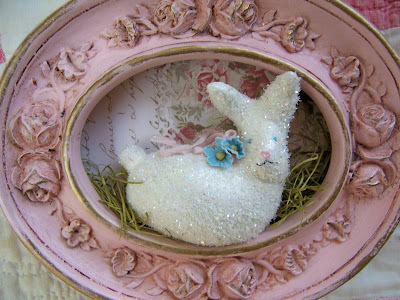 Lori has many other gorgeous hand crafted treasures available in her Etsy shop. Go check it out!!!!!!! Just checking in to say hello. I have been busy working on work stuff , some new stuff, and managing life stuff in general. I'll be back in a day or two with some pics... in the meanwhile... one of my favorite songs... hard to believe this song is over 20 years old! It never gets old to me though :-). I hope everyone had a nice week. I just got back from my work trip and it's so good to be home. I am really looking forward to catching up on everyone's blogs over the weekend. Hooray!!!! !It's Friday! When I was a girl growing up, Friday nights often meant a trip to the local cinema. Whatever was on the screen wasn't 1/2 as important as snacks we indulged in while snuggling down into our creaky theater seats. To this day we love movie going. But alas! There's no movie theater within this tiny town of ours, so the closest big screen is a 34 mile commute to Flagstaff. 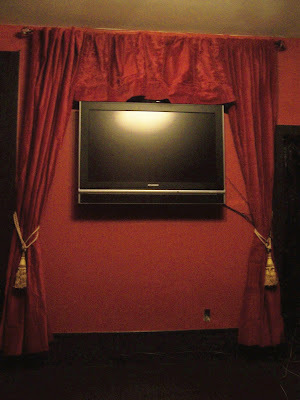 Being movie lovers, my husband and I always dreamed of creating our own indoor theater. 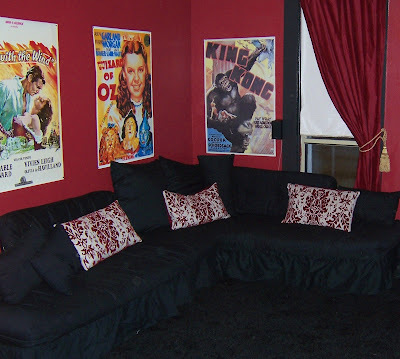 A few posts back, I showed you pics of the couches and posters we ordered that we thought would fit our theme of "Art Deco movie house". 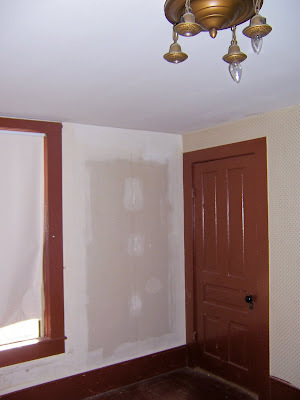 We'll, we ordered them, they arrived, and..... we could not get them through the TV room's tiny Victorian size doors!!! We pushed, we pulled, we argued... we gave up defeated. The upside of the couch problem was all the yards of bubble wrap they used to pad their journey. I am never at a loss as to what to do with bubble wrap!!! 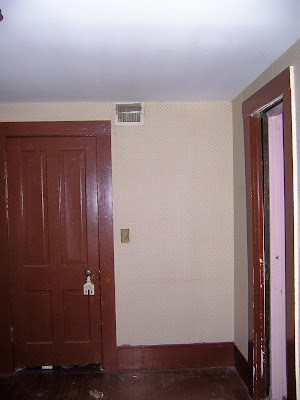 Added... red paint to walls, charcoal paint to floor and trim, red velvet curtains to window, comfy shag rug on floor. 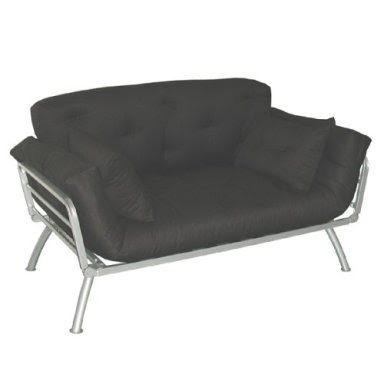 Futons placed in L shape with added black dust ruffles to cover up ugly metal legs, and art deco-ey looking red and white velvet pillows. 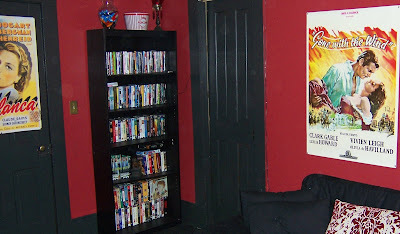 Movie posters on the wall.... bookshelf from Target in the corner to store our favorites, plus a jar of candy. This is also the future home of the mini popcorn machine! To the right of the TV (in the pic below), there is a little closet that goes under the stairs where we house all of the electronic equipment and a mini fridge for keeping our drinks cool and at the ready. Shhhh... It's time for the show! I hope everyone had a good weekend. Most of mine was spent re-doing our TV room. I'll post some before and after pictures after I get back from my business trip on Thursday. 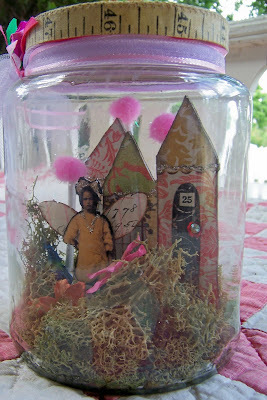 I wanted to share the photo stream (above) of my June PFATT Halloween in July offerings. The Pumpkin Pixie sold immediately, but Little Miss Bliss is still available here. I am very late in posting the picture below. 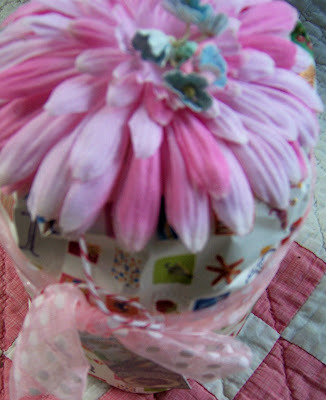 It is from the very sweet Shabby in the City. I was fortunate enough to acquire it during one of her "flea Market Friday " sales. 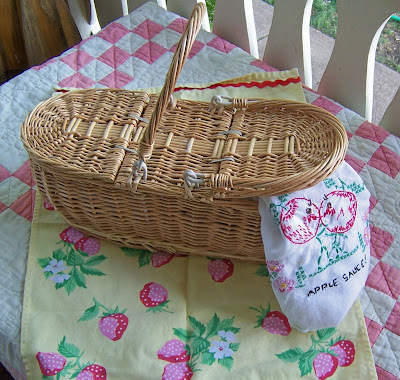 Can you just picture it filled with good wine, cheese and bread for a romantic picnic for two? 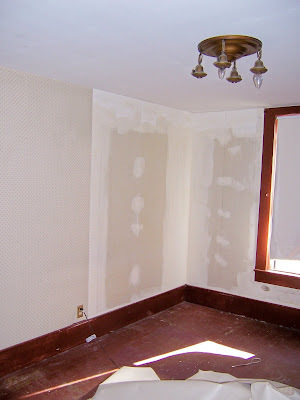 I'll be back in a few days with my TV room makeover pics. Have great start to the week everyone. 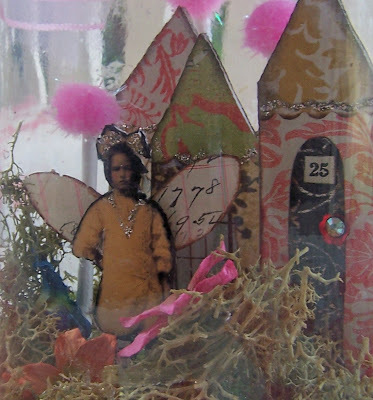 It's the most beautiful fairy jar from the incredibly talented hands of Maija Lepore ! I am overwhelmed by how gorgeous it is. I wish you could all see how detailed and wonderful it is in person! 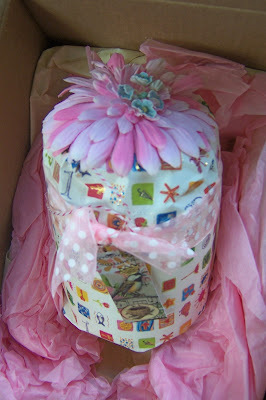 And the wrapping!And did you see the lovely top with the flowers???!!!! Beautiful! Thank you so very much Maija! I absolutely love it! And thanks again to the sweet Melfie for hosting this fabulously fun swap!!! 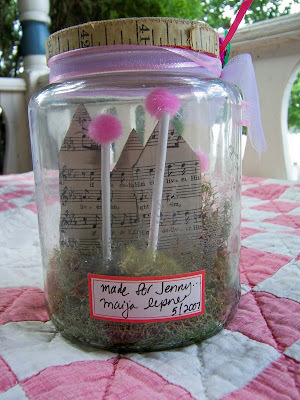 To see pics of more fairy jars from this swap (including the one I made for Maija), go here ! 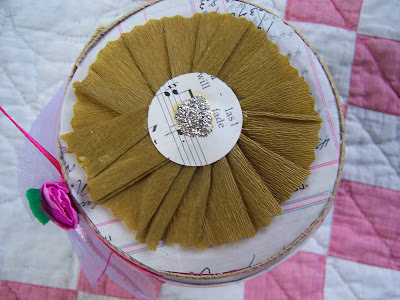 Please bear with me as I update the look of the blog. If you have the time, I invite you to click on the video to hear the lovely music of The Ink Spots.